Lekuona JM. Geographical and seasonal variations in the diet of the Bittern Botaurus stellaris in the Ebro valley. pp. 1-10. Have you ever seen a bittern? Now, imagine to watch more than 2.300 prey captures! Thanks to this outstanding job, we can know what the bittern are eating and how their diet varies along the year and among habitats. Sovrano LV, Beltzer AH, Regner SA, Lorenzón R, León E, Olguín P, Ceppi G, Rocha A. Reproductive biology of the Roseate Spoonbill Platalea ajaja in Santa Fe, Argentina. pp. 11-18. In spite of the broad distribution of this species across south America, there is few information about its biology. This study shows the first data for a population breeding in a urban area of Argentina. García-Barcelona S, Camacho Vacas E, Macías D, Salinas MP. First records from the Mediterranean of a Sooty Shearwater Ardenna grisea caught accidentally by a surface longline. pp. 19-24. Unfortunately, bycatches are a serious threat for seabird conservation. However, this accidental captures may provide sometimes information about rarities. Lara Pomares JA & Fajardo Sánchez A. Posnuptial migration of the Willow Warbler Phylloscopus trochilus in a meadow of Albacete. pp. 25-32. Monitoring the complete migration in a constant effort ringing station offers novel information on the poorly known passage of this species across the inner of Iberia. 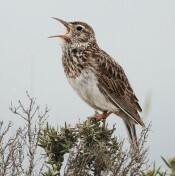 Pérez-Granados C, López-Iborra G. Biology and conservation of the Dupont's Lark Chersophilus duponti. pp. 33-54. One of the most iconic and threatened steppe birds of Europe is the target of this exhaustive review about the latest advances in the knowledge of its biology and conservation status, with special interest in the peripheral populations of Valencia..
Baos R, Hiraldo F. Sublethals effects of the exposure to the Aznalcóllar toxic spill in long-lived birds. pp. 55-81. This year marks the 20th anniversary of one of the great ecological disasters that have taken place in Europe. This review checks what effects were observed and if they can still be detected in birds. 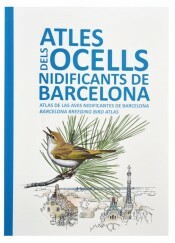 Weiserbs A. Atles dels ocells nidificants de Barcelona by Marc Anton, Sergi Herrando, David Garcia, Xavier Ferrer & Rafael Cebrian (2107). p. 83. Ressenya bibliogràfica sobre el recent atles de les aus nidicants de la ciutat de Barcelona coordinat per l'ICO.